Jeremiah Harvey, the 9-year-old boy accused of groping a woman at a Brooklyn convenience store last week, told "Good Morning America" that he was deeply embarrassed by the allegation, which was proved false. "I've had this lately on my mind," Harvey, who is black, said while seated next to his mother in the tearful interview that aired Friday. "I felt humiliated," he added. The incident happened when Harvey was at the convenience store with his mother, Someko Bellille, and his younger sister. Surveillance video showed the woman, Teresa Klein, who is white, leaning over a counter when the boy's backpack seems to graze her rear, his hands clearly not touching her. But Klein thought Harvey groped her and appeared to call police. (New York police told CNN they had no record of any such call.) In video of the incident, she is seen shouting into her phone that she had been "sexually assaulted by a child." The video, which bystander Jason Littlejohn posted to Facebook, pans to show Harvey and his sister crying on the sidewalk next to their mother. 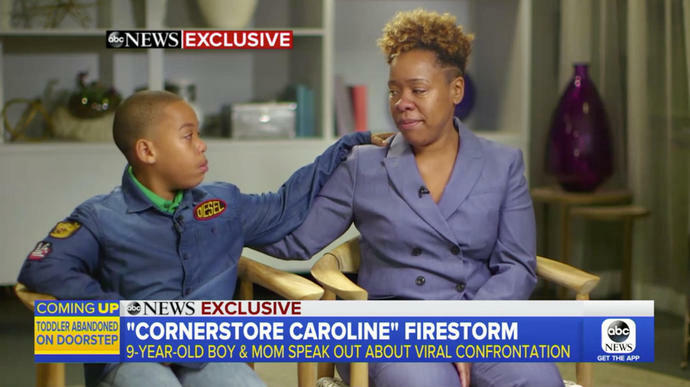 Dubbing Klein "Cornerstore Caroline," a nickname in line with others intended to deride the parties who call police for trivial reasons, Littlejohn's video has racked up more than 8 million views. Bellille explained that, as the family walked away, her son was afraid police in the neighborhood were going to "take" his mother. "I was wrong," she told a New York ABC affiliate. "Young man, I don't know your name, but I'm sorry." Klein said that Bellille had "escalated" the situation and she had lost her temper at Harvey's mother. The child initially refused to accept the apology, telling the station, "I don't forgive this woman, and she needs help." But in his "Good Morning America" appearance, the boy changed his mind. Asked whether he forgave Klein, he said, "Yes, yes I do. Friendship is the key." "To be having a conversation with your son about sexual assault at the age of 9?" she asked. "I never thought I would be having this conversation at all."